Ce papier translucide est idéal pour le pliage de tessellations en origami. Contrairement au papier calque, il ne casse pas au plis et permet ainsi un bel effet de superpositions de ses couches. Contrairement au papier de soie, il est très solide et tient très bien le pli. Il est ainsi parfaitement adapté à tous pliages complexes. Important : Les feuilles au formats 50x50 et 70x70 cm vous seront envoyées pliées. Elles contiennent donc forcément des traces de pliures qui ne devraient, cependant, pas gêner l'aspect final de votre modèle. En commandant ce papier, vous acceptez de recevoir ces feuilles pliées. Buena calidad del papel y muy interes... (Lire la suite)ante textura. I folded origami euthysanius beetle witth th... (Lire la suite)is !! Unbelievable!! Always great dealing with Origami-Shop<... (Lire la suite)br /> At first I thought it was taking a little while to receive, but then I saw it came out of France...wow! Was so excited to be able to fold my first tessellation snowflake with paper I have never worked with before. Thank you so much for being there when we cant find it anywhere else. Vraiment très fin, parfait pour une... (Lire la suite) tessellation multi-couche! Awesome paper! It's great for tesselations.... (Lire la suite) It's a pity it is only available in white. I'd love it if it came in different colors. Very nice kind of tracing paper. Super thin ... (Lire la suite)and nice to fold. incredible paper for any miniature mode... (Lire la suite)lling or tessellation origami. Looks amazing when photographed with light at correct angles as well. Molto bella e delicata. Non semplice da... (Lire la suite) piegare. Great for models that require excessive stacking of layers or thin appendages. Reverse folding can b... (Lire la suite)e frustrating and creases show very clearly, but good for test folding insects. Not prone to ripping. Pour les réalisations en jeu de lumière et transparence, excellent! Very thin, strong paper, that holds creases quite well but I don't like the feeling. Even the touch of the paper is very special. Folding complex models from this paper is like a dream. This is the best paper for super complex model! Very crinkly, but after you get the hang of it, then it is very easy. ce papier ne peut pas être utilisé comme tel, il faut coller avec du papier métallisé pour des m... (Lire la suite)odèles complexes. Have not used yet but it is as I expected, but thinner, which is good. It's just so thin, but it plays with light in a very cool way. Hard to tear, making it perfect for m... (Lire la suite)odels that require a lot of small folds for details. Since it is the biggest size, you need to be mindful that it might arrived crumpled. That's what happened, despite the durability of the shipping box, but it will not tear. 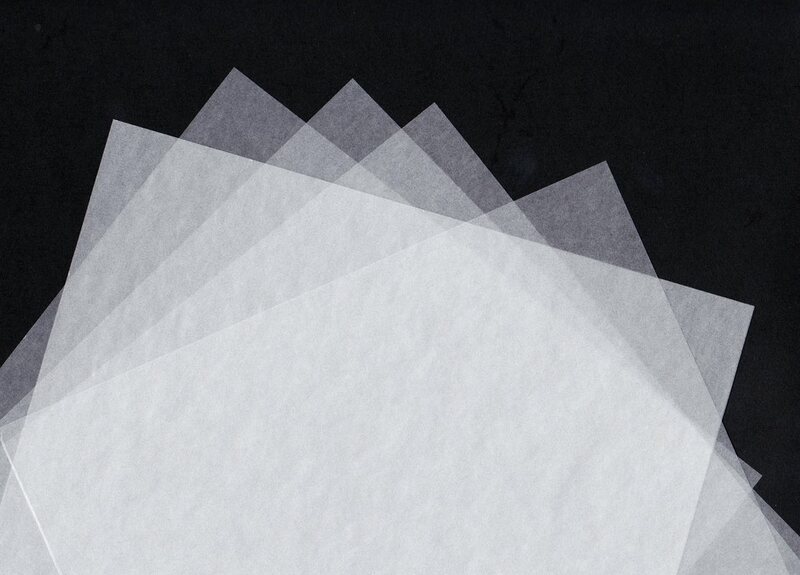 High-quality semigloss paper, currently planned for a tessellation. Glassine paper is very very thin but also very very strong. It's a great paper to fold small complex... (Lire la suite) models, with small thin details. Molto bella e delicata. Non semplice da piegare. I like this paper for intermediate origami models. I really like the thinness of this paper and the ... (Lire la suite)durability of it. One thing I don't like about is that it doesn't refold on itself very well. i.e. When I make a mountain fold and then make that fold into a valley fold it doesn't work to well. It does really well for sink fold and if the sink folds are small but if I am sinking a large part of the model I find it hard. (It is easier to make that fold with kami paper then this paper. partly this happen because it is so thin.) Other than that it is amazing for folding a really complex model bases. Only got two sheets. Tried one out with a tessellation and am happy with the result. Not sure how mu... (Lire la suite)ch I'll use this over other papers.